Great art has the capacity to stir up phenomenal emotions within us, even if that’s a sense of unbridled terror. 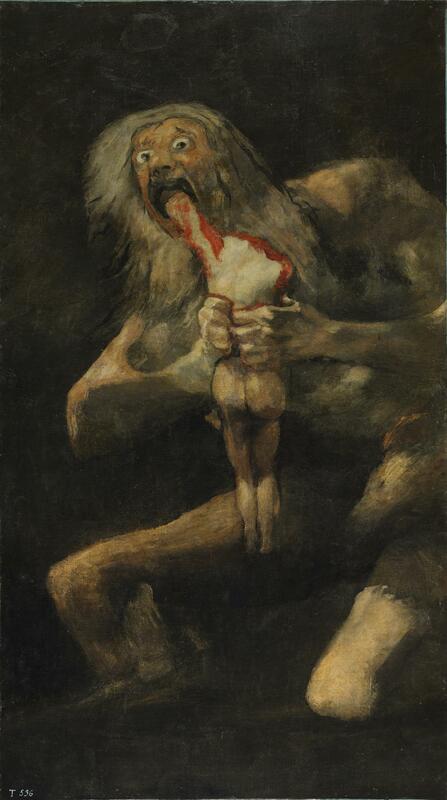 As that’s what Francisco José de Goya y Lucientes’ (1746-1828) disturbing painting below certainly does for us. Bloody hell. Look at that thing. Everything about that piece is frightening, as Francisco Goya didn’t paint it for public viewings. Sometime between 1819 and 1823, the Spanish romantic painter committed 14 Black Paintings onto the walls of his home near Madrid. His depiction of Saturn from Greek mythology was one of them. The myth is about the Titan Cronus (Latinised to Saturn for the piece). He had a terrible fear his children would overthrow him. That fear was probably because Saturn overthrew his father to rule during the Golden Age. Regardless, his solution was to eat each child at birth in a paranoid frenzy. Despite his cannibalistic ways, Zeus eventually escaped the horrible fate and did indeed overthrow his father. After that, he imprisoned the murderous fiend for his remaining days. Quite what was going through Goya’s mind when he added that to his property we’re not sure. Was he of sound mind? Left totally deaf after 1792 due to a fever, he moved to Quinta del Sordo (Villa of the Deaf Man – named after its previous owner) in 1819. And in the picturesque home below, a slump into a mental health battle appears to have taken place. The result of which were 14 gothic masterpieces. Scholars of his work theorise he was worried about death. At the point of painting he was in his early 70s and had suffered several terrible illnesses. But upon first moving into the home, he painted some inspiring ideas in line with his established canon. Then, in an abrupt and macabre change of mood, he headed down a deeply disturbing path. He didn’t intend for anyone to see the works. Only after his death – following a 70-year delay as his home changed between owners – did it finally become available to the public. Salvador Martínez Cubells (1845-1914), chief art restorer at the Museo del Prado, transferred the 14 works onto canvas for posterity. But that does mean, for several years at least, Goya was wandering around in his home taking in that painting whilst he, say, had a cup of tea or glass of wine. Or invited friends round to socialise. If that’s the case, they no doubt left Goya’s home with the haunting gaze of Saturn forever seared in their memory. Previous Will John Bercow Yelling “Order!” Solve The Brexit Nightmare? I was recently watching a Doc. about this, unfortunately it was on a Sci Fi channel and they asserted that this may actually have been the interpretation of ancient people witnessing an alien landing….It seems Zeus made (in this story) Poseidon the Dad spit up the “eaten ” siblings and all was well again. I didn’t make this up. I’m willing to bet it was just Goya and his generally propensity to draw stuff. Some of the surrealist are really out there, but whatever floats your boat eh? Water floats my boat. And sometimes cake (liquefied by aliens). Soggy cake and aliens, a bad Friday night. A bad Friday night is living in a house with Saturn Devouring His Son staring down on you. Goya brought this on himself! Where’s the nearest hotel …I’m not sleeping there. Fallowfield – £20 a night. Good view of a main read leading into Manchester city centre. There may be chavs pelting beer bottles at your window, but flip them the bird and they’ll respek you. Innit. £20 a night! At the lovely Fallowfield? Those beer bottles, can I trade them in? I’m chuffed! innit! Fallowfield is student heaven, but I had a good run there in 2008 – July 2009 as a post MA (of London) young ‘un. Don’t track my history, please. Hmmm, Fallowfield you say? a good run? 2009… scribbles down pertinent information. Please note: no scribbling is allowed here at Professional Moron. Aren’t we the fussy one. I save my scribbling for my life journal. The ladies will be arriving soon, please try to save some tea and crumpets for them. Saturn? Look at Saturn’s face. I have the same reaction to this painting, as I did in the moment when I realized I should have bought a Playstation instead of a SEGA SATURN. I ate $300 and lived to regret it. Argh! Yes, unfortunately the Sega Saturn wasn’t incredible. So Saturn’s face here should become a meme for any disastrous purchases.